Pink and Purple stuffed cat toy. with cute matching shawl. Adorable Cat Stuffed Toy. 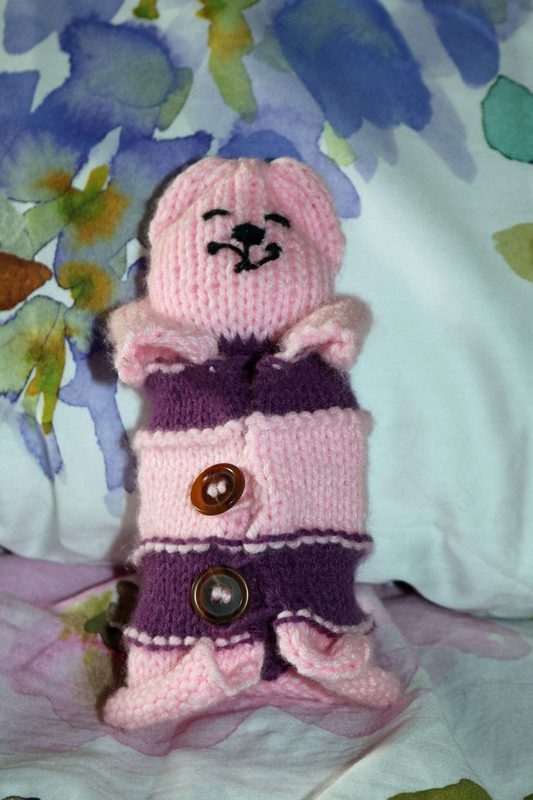 Cat Soft Toys , Pet Toys are hand crafted and knitted with care, attention for those young at heart from children to more mature. Knitted cat toy. Snuggle up with these. A little of me goes into each of these adorable creations. The items are hand loomed and stuffed with high quality Loops and Thread fiber fill. The shawl is purple and pink stripped in panels. and wrapped around the toy. it can be rolled out to act as a blanket - perfect for playtime. Please note the vanessascare2knit will not appear this is for display only. Perfect for anytime of the year birthday, or party favors for grab bags and treat bags! Give an older person something to snuggle, or curl up with a book yourself or pet. We delight in making a custom order for you, provided we have the coloured yarn, please allow 3-5 business days for completion. Simply send me a convo. Please provide: complete addresses, including P.O. Box and a telephone number this is a requirement by Canada Post. I will fill out the customs declaration and provide you with a photo of your order. All items are carefully packaged with care and attention. I promise to follow up with you via email that you provide. Shipping: Is by Canada Post International Mail to overseas destinations, continental USA, England, Europe, and Australia. This is by regular post and no tracking is available at this time. Usually taking 10 - 30 days depending on the destination. Please be aware that items have to clear customs in both exit and entry of the countries. Please choose the shipping profile that suites your needs.